What makes a good curry puff? Honestly, I’m no connoisseur when it comes to deciding one. Blame it on my low-heat/spice tolerance level, I couldn’t really enjoy those curry puffs packed with robust spices and tongue-numbing heat. 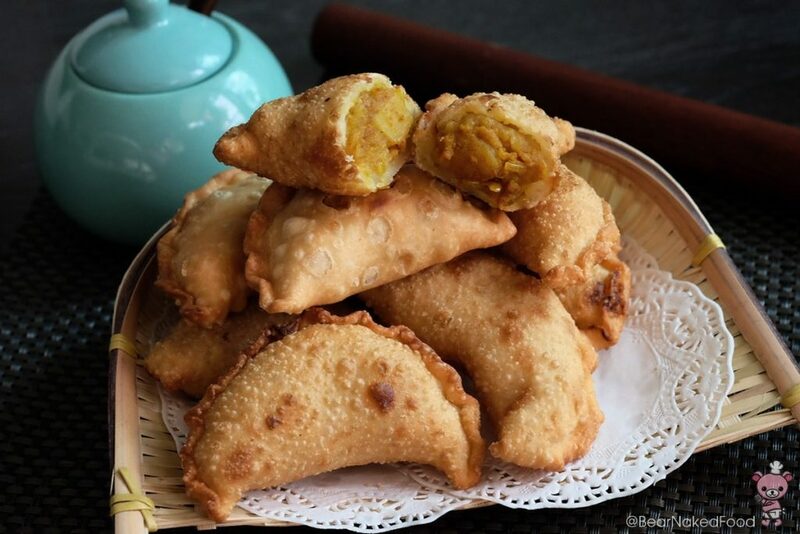 Unfortunately, other than the school canteen Malay Epok Epok aka Malay Curry Puffs (which I absolutely love), I can’t seem to find any with milder curry spiciness. 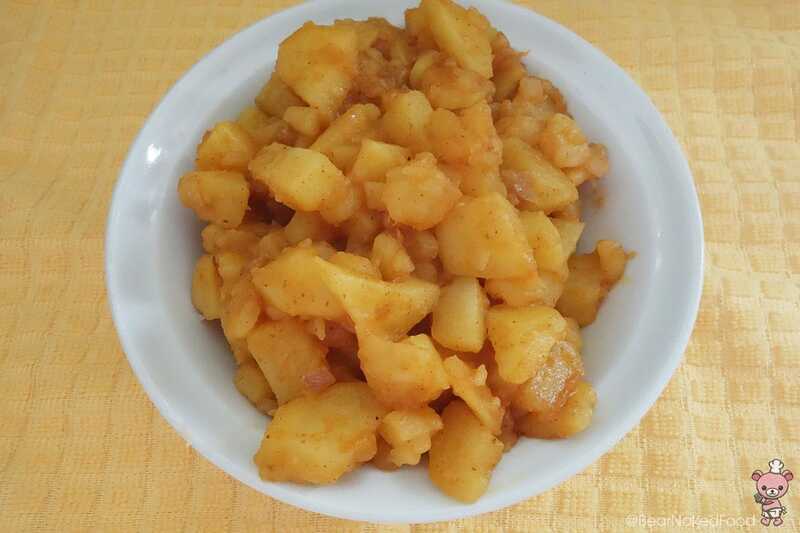 So, I embarked on my “mini adventure” in search of a decent recipe which mimics that of my childhood favorite canteen snack. To start, there are a few types of dough – spiral (combining 2 different types of dough), flaky and buttery, thin and crispy. 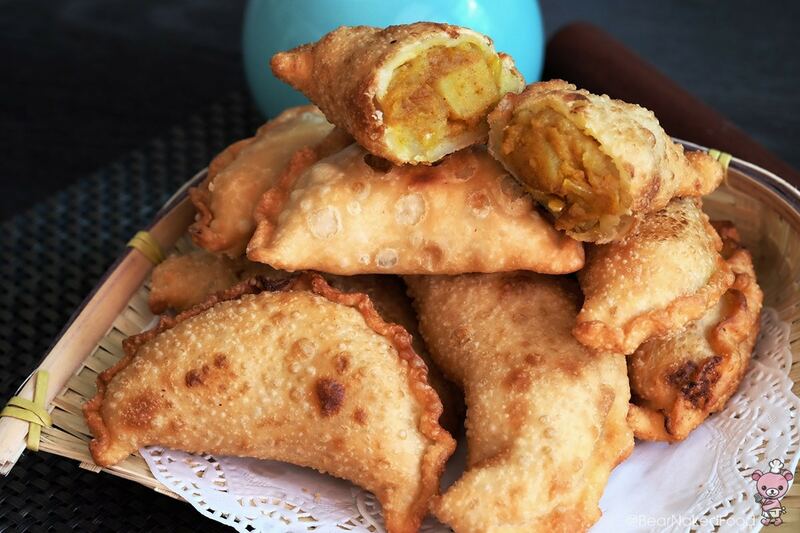 As the title of the recipe states – Easy Potato Curry Puffs, it’s all about EASY so I strike off the first two types and opted for thin and crispy version. 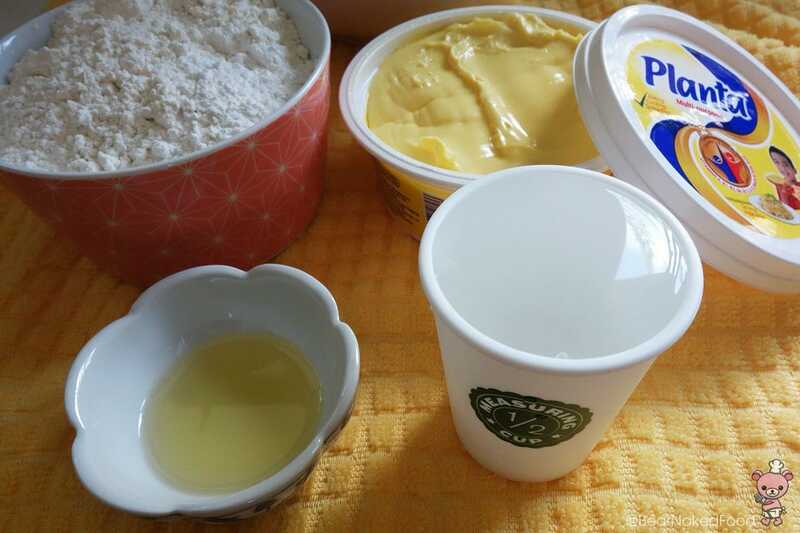 Most of the recipes call for the use of plain flour, the only source of gluten. 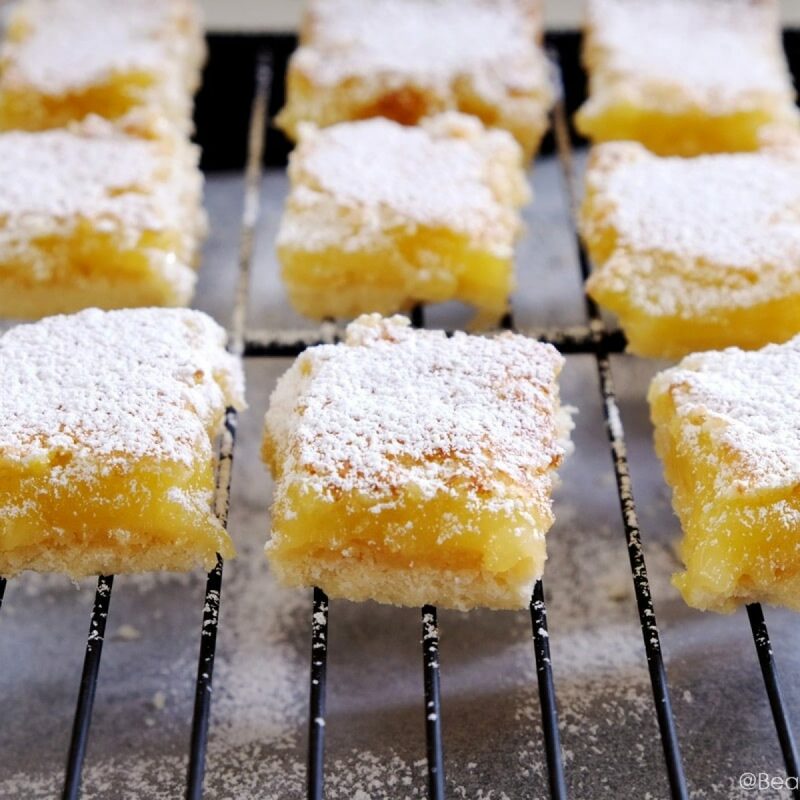 My first batch was made entirely using only plain flour and while it tasted good, the texture was kind of dense and went “soft” on me in no time. I ran home to mom in tears…okay, I did not. I went back to mom’s and shared with her my experience. Like everything else, mom never ceases to amaze me as she always have the answer. 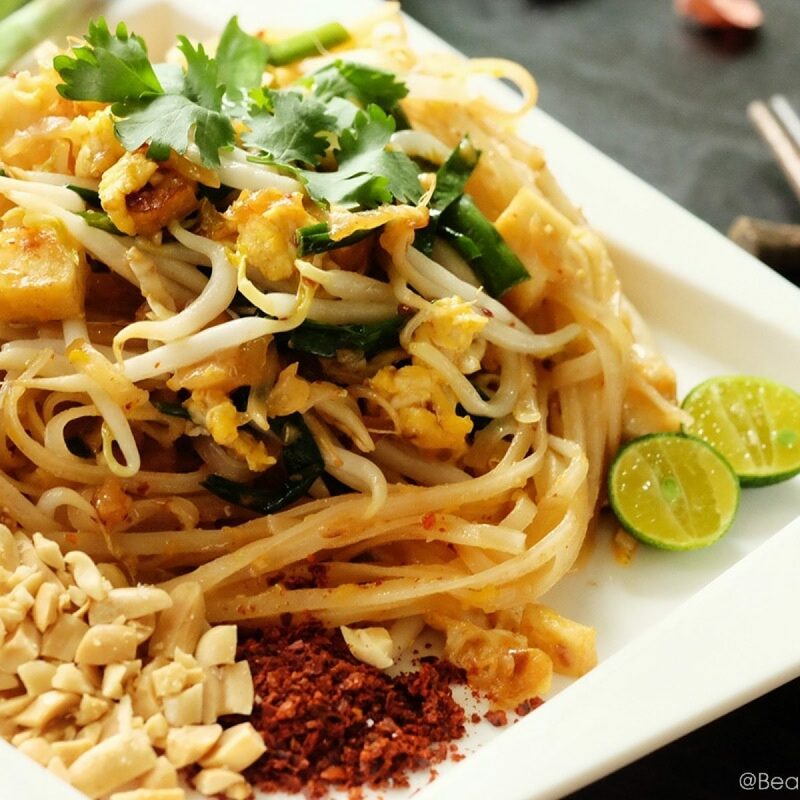 She suggested to include rice flour and tapioca flour (to lighten the dough and add crispiness) rather than just plain flour. Later, I found out she learned it from her old Malay neighbor. Unfortunately, she has moved away few years ago, so I can only thank her by sharing her valuable tips. Armed with more confidence, I presented my second batch to my trusty taste testers. The reviews of the pastry texture are mixed. Some said the texture tasted exactly like Malay Epok Epok while another said it was a thinner version of Old Chang Kee. All agreed even though the heat of potato filling was on the milder side, the flavor was definitely spot on. And THAT was exactly what I was going for. To make it more substantial, I’ll definitely be adding hard boiled eggs into the filling for my next batch. 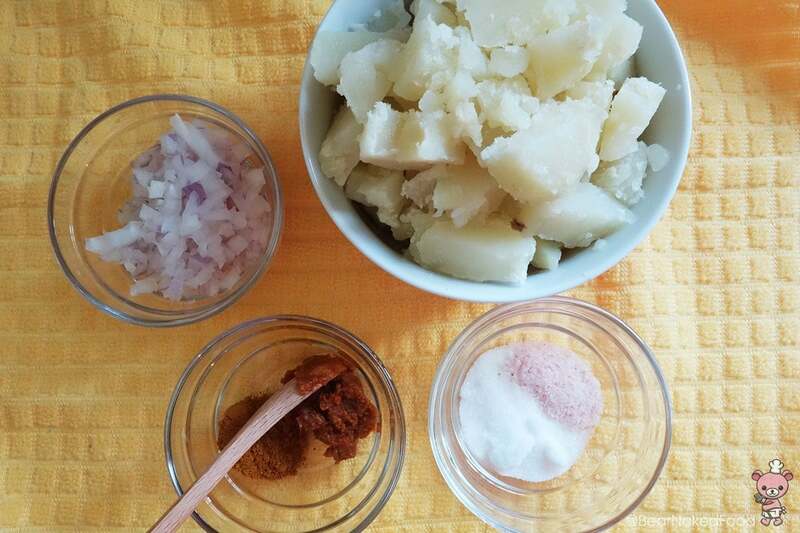 In a large pot of boiling water, add the potatoes and cook under medium low heat for 30 mins or until soft. 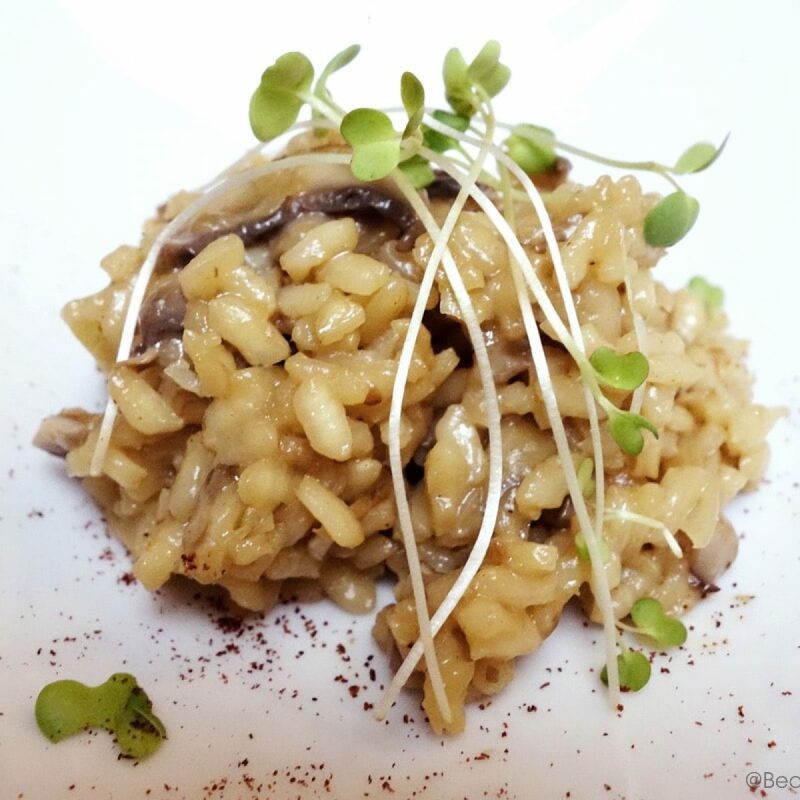 Drain and let it cool before dicing into small cubes. 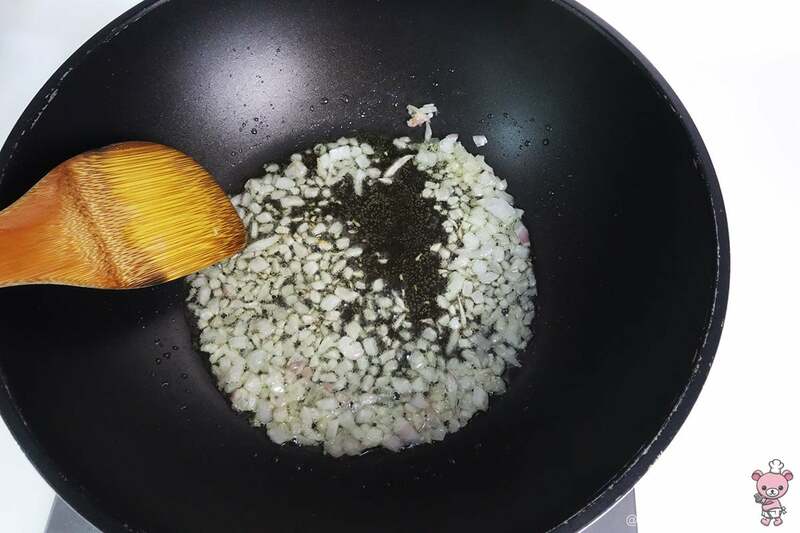 In a pan, add 2 tbsp oil and saute the red onions, until fragrant for 2 mins. 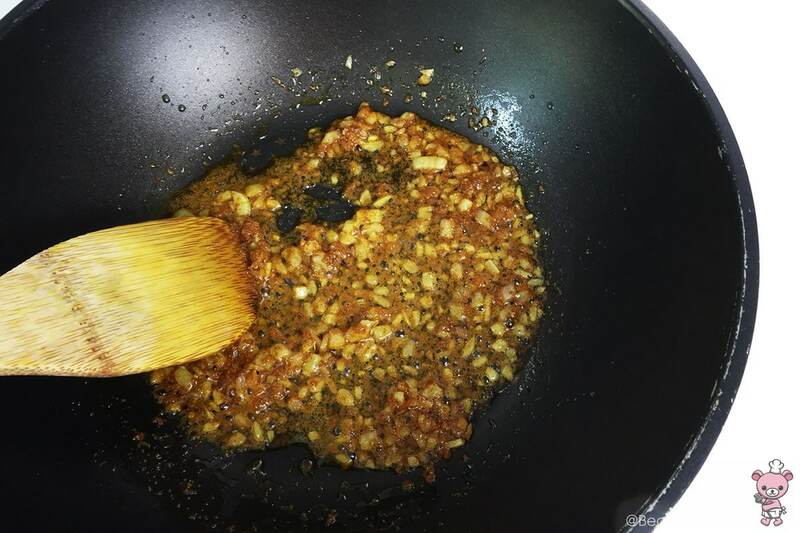 Add in curry powder, curry paste, salt and sugar and cook for another minute. 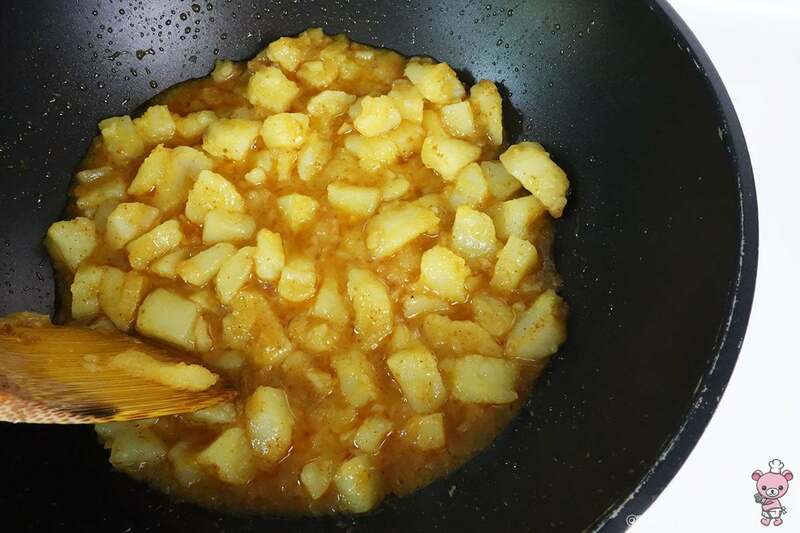 Add in diced potatoes, water and mix well. 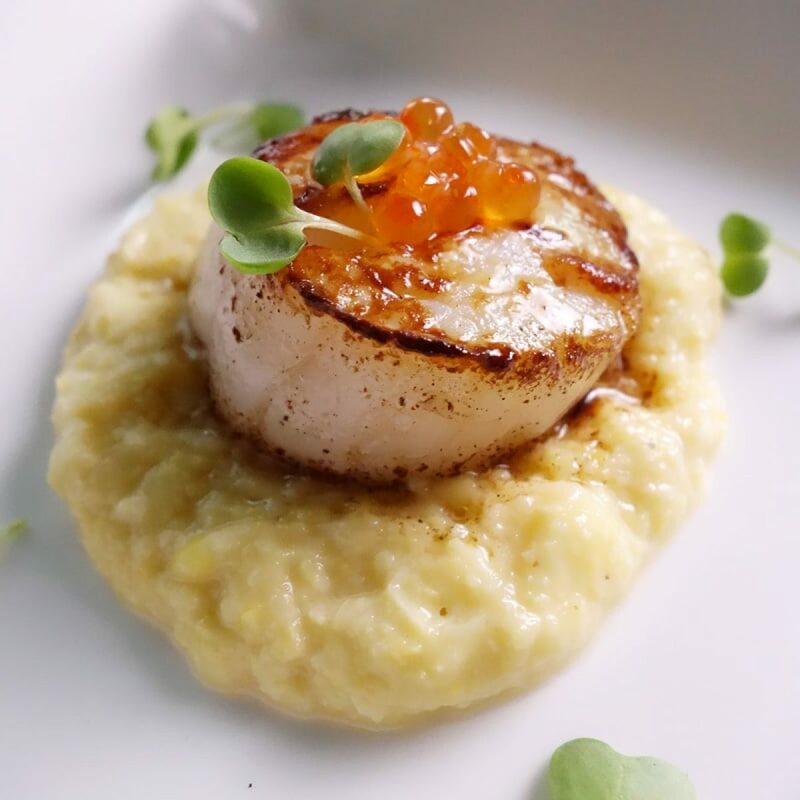 Cook until the water is fully absorbed. Remember to always taste and adjust the seasoning accordingly. 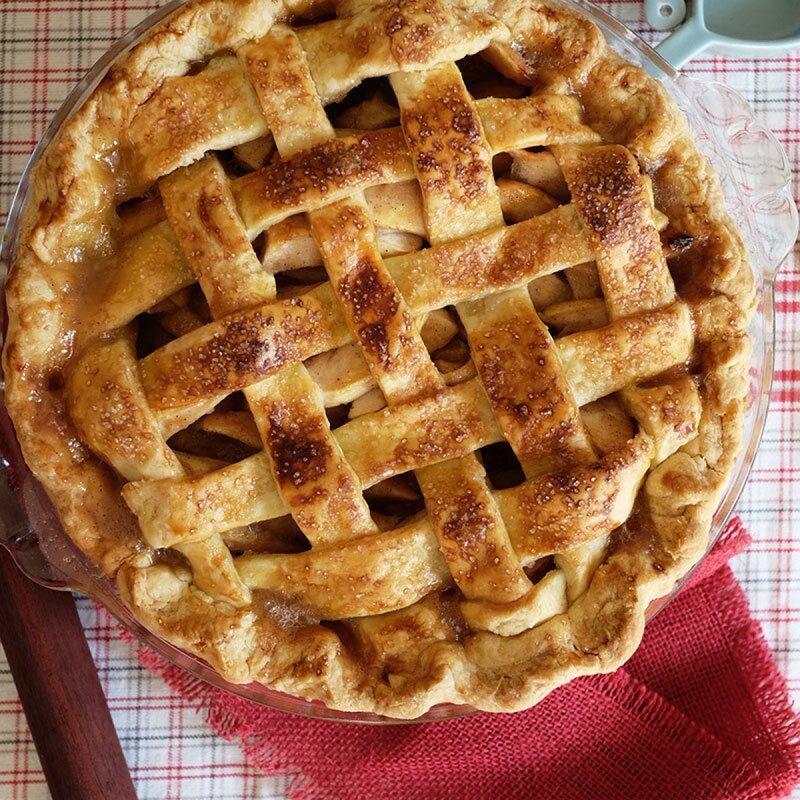 Set aside and let it cool before using. 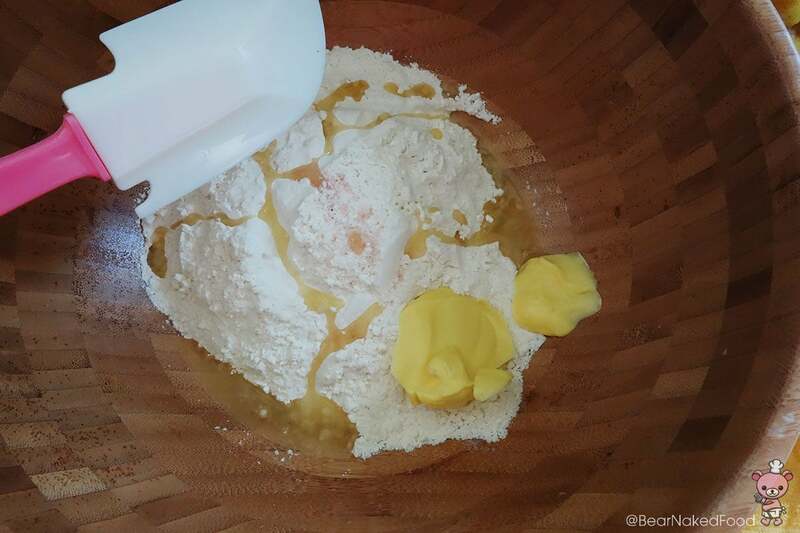 In a large bowl, add in 3 types of flour, salt, oil and margarine and mix until crumbly. Use your hands if necessary. Add in water slowly, 1/3 at a time, and mix until the dough comes together. Depending on the humidity level of your kitchen, you might need to add lesser or more water. Transfer the dough on a clean surface dusted lightly with some flour. 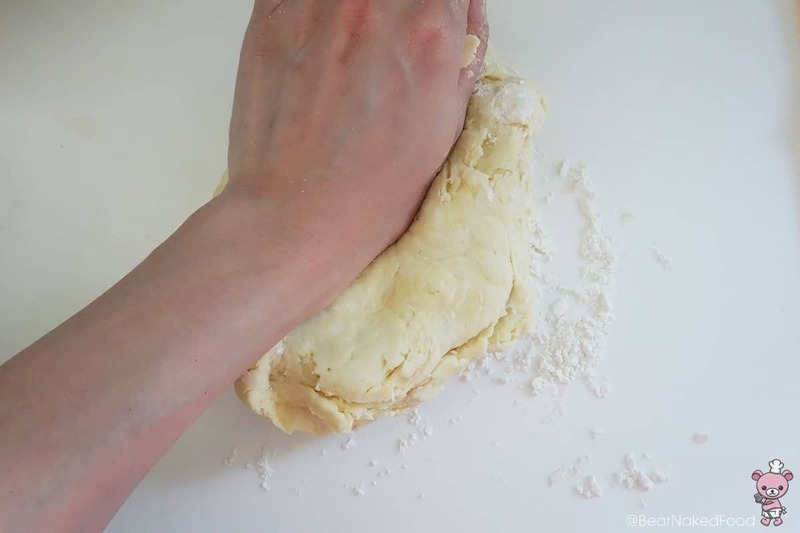 Knead the dough until it is smooth and elastic, about 5 mins. Knead for at least 5 mins to work the gluten. This step is crucial. Place the dough in a bowl, cover with cling wrap and let it rest at room temperature for 30 mins. 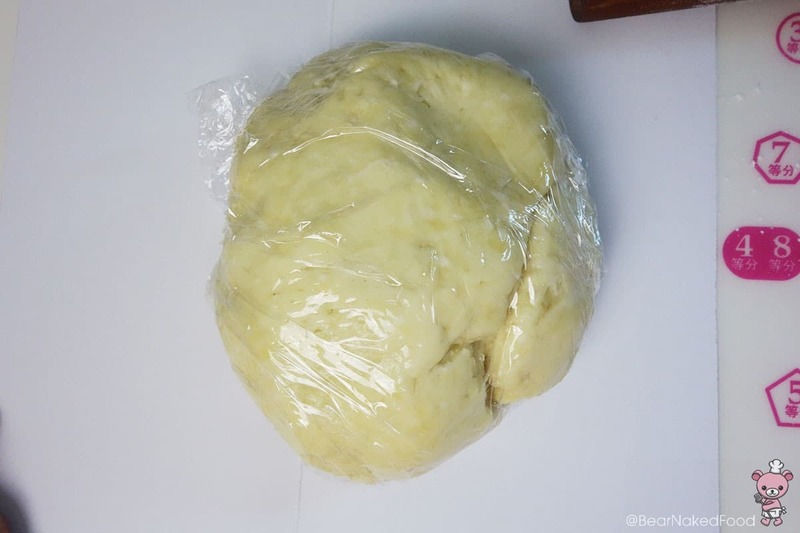 On a clean floured surface, cut half of the dough and roll it out into a thin (about 2mm) diameter. Use the ring cutter to cut out round molds. 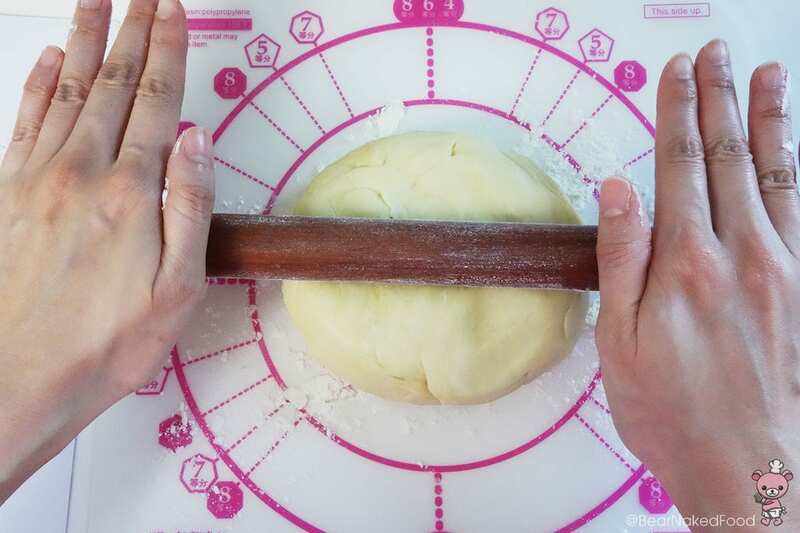 Alternatively, invert a bowl and use a knife to trace around the circumference of the bowl. 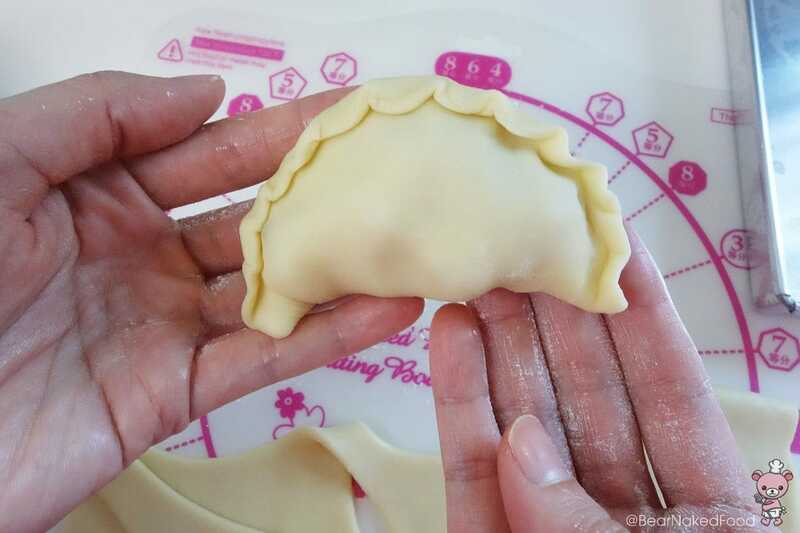 Place 1 tbsp of the filling in the center of the dough and brush some water around the edges. 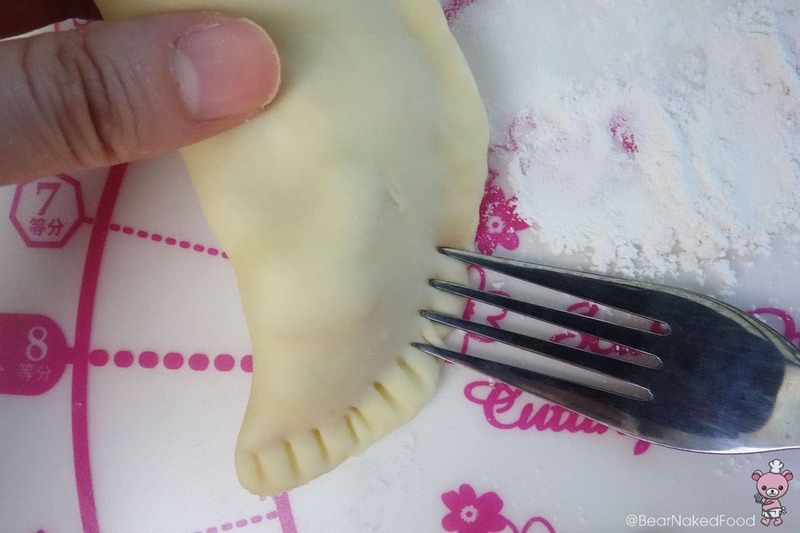 Fold into half, over the filling. 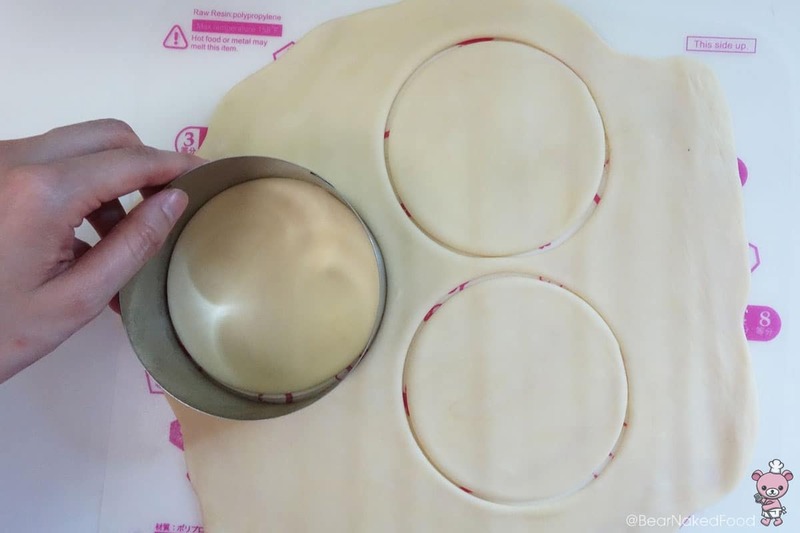 Seal the edges with using a fork or your fingers securely, so the filling will not leak out during cooking. 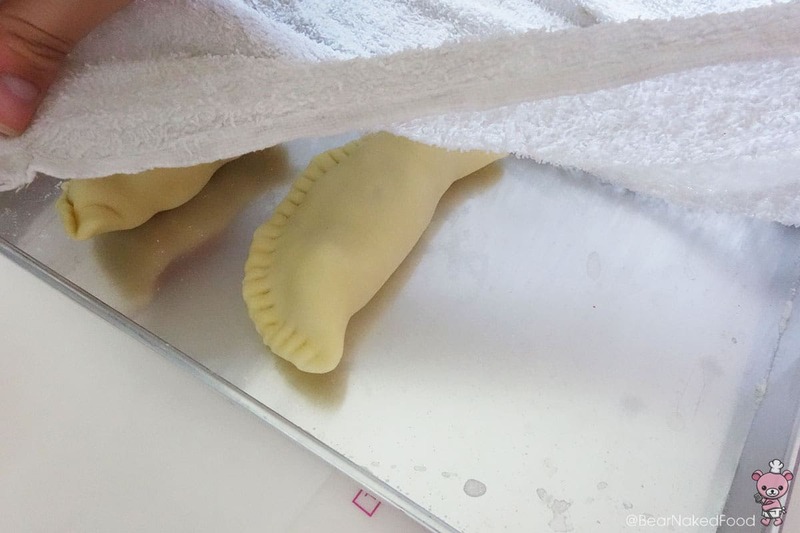 Cover the curry puffs with a slightly damp cloth until ready to use. 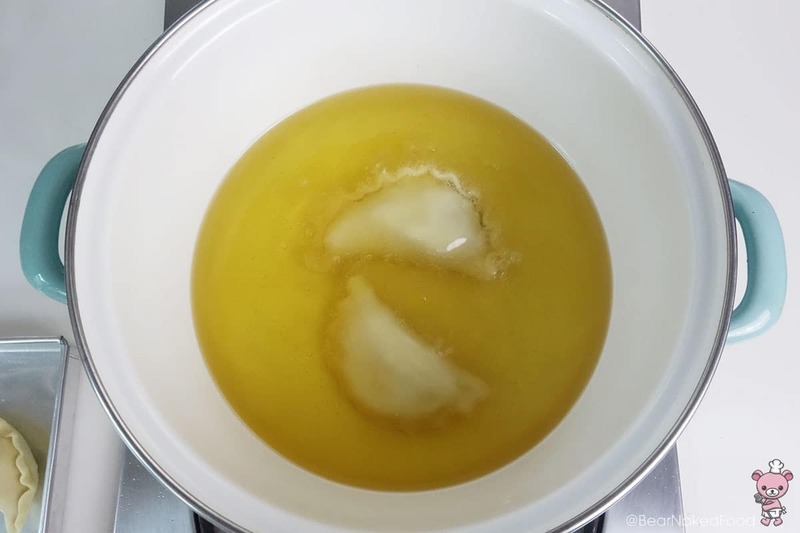 In a large wok or pot, heat up oil (approx. 4-inch height) to 180°C/350°F. 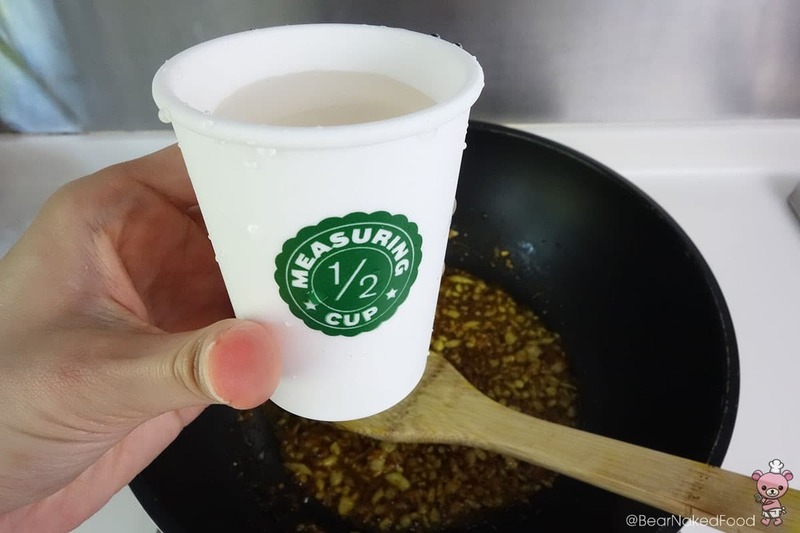 If you do not have a candy thermometer, stick a chopstick in the centre of the oil. If you see small bubbles forming, then it is ready. 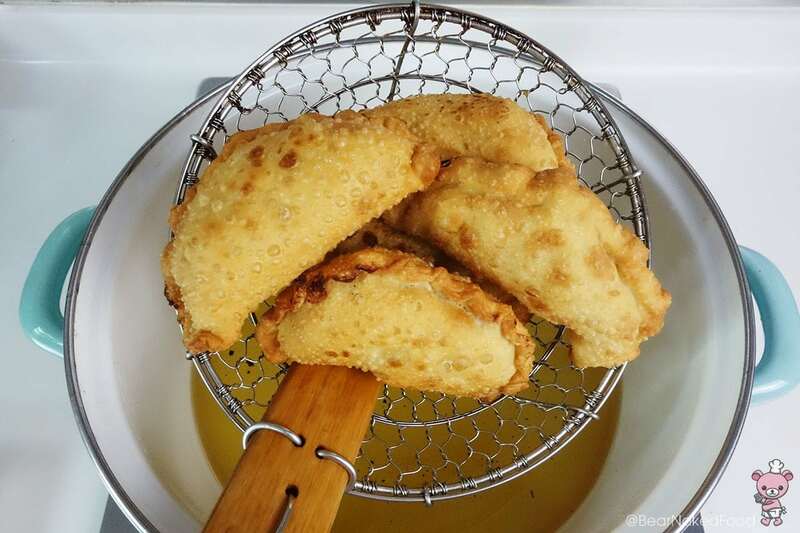 Gently add in the curry puffs and fry until golden brown. It should take about 1 min. 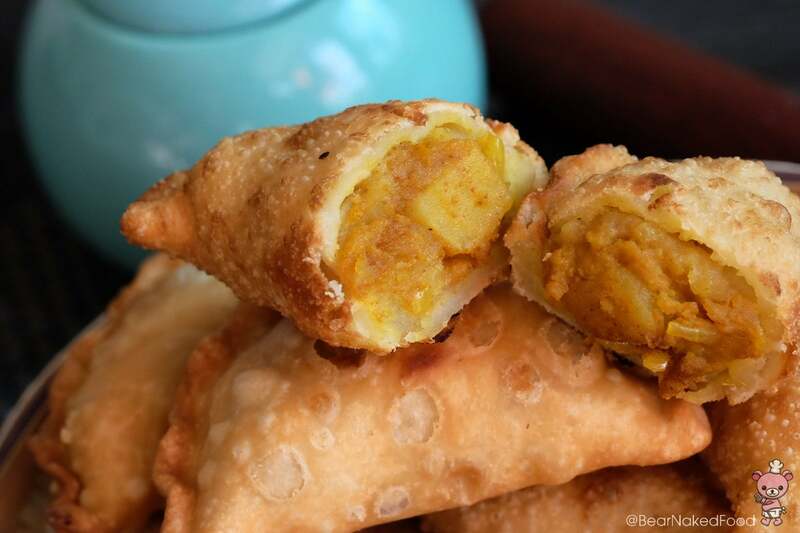 Do not overcrowd the pot by adding too many curry puffs at a time. 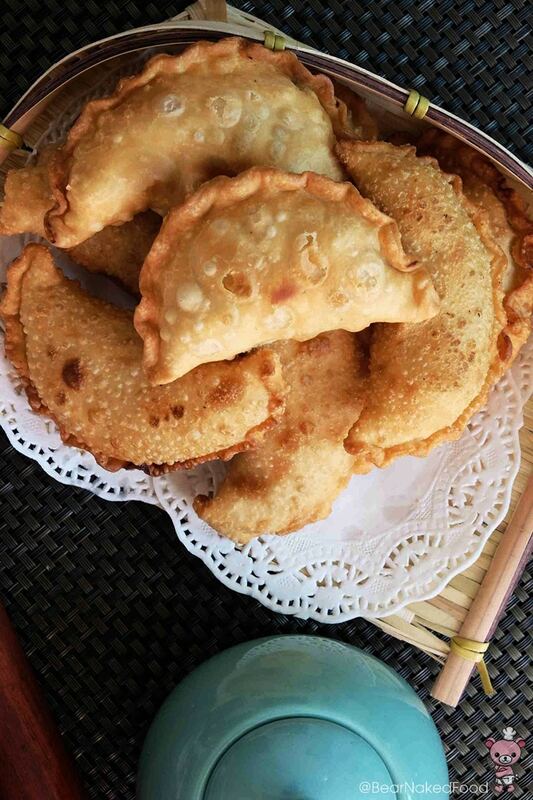 Tip: To avoid bubbles forming on the pastry skin, add the curry puffs half way before the oil is fully hot. Drain on paper towels and let it cool slightly before consuming. 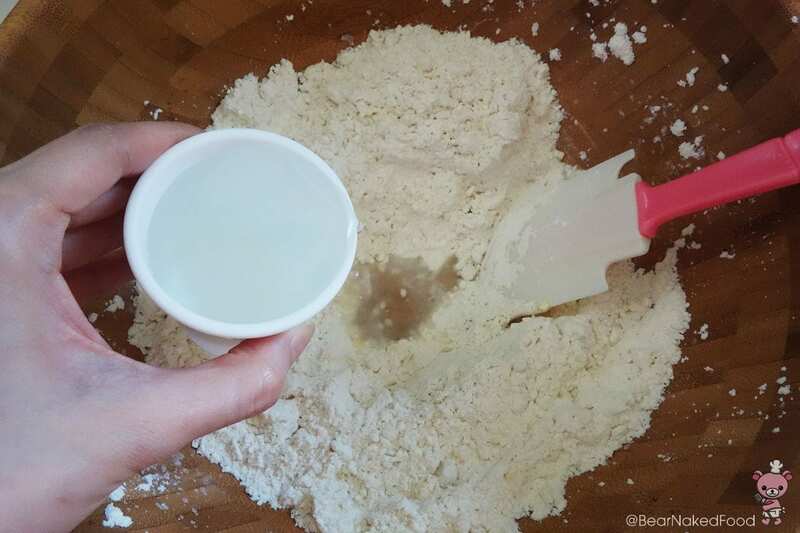 Add in water slowly, ⅓ at a time, and mix until the dough comes together. Depending on the humidity level of your kitchen, you might need to add lesser or more water. 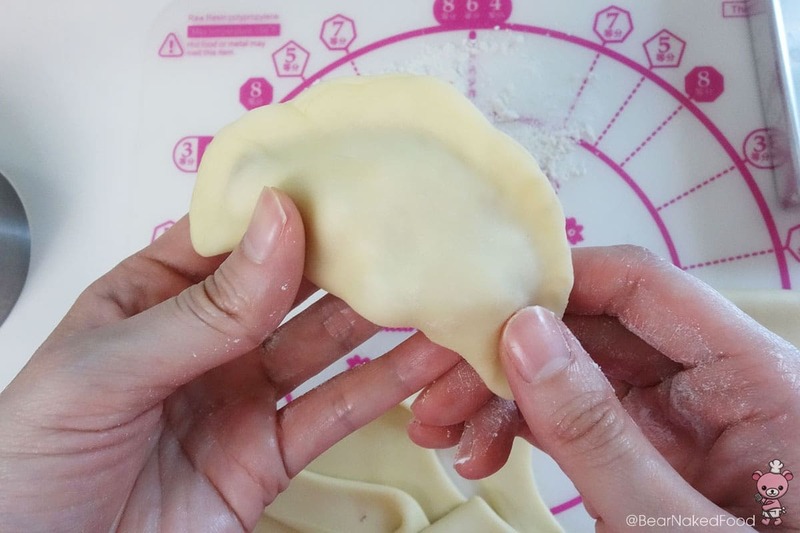 Place 1 tbsp of the filling in the center of the dough and brush some water around the edges. 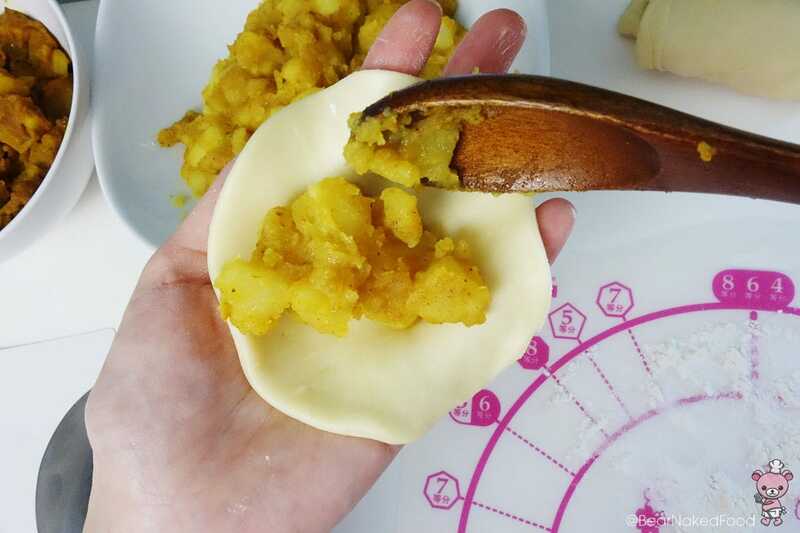 Fold into half, over the filling. 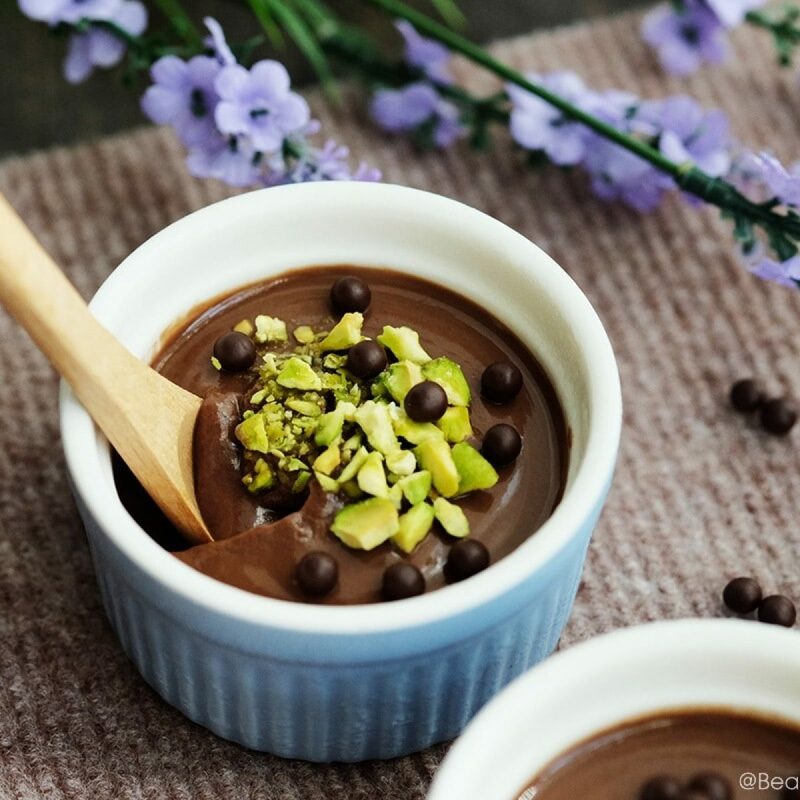 Seal the edges with using a fork or your fingers securely, so the filling will not leak out during cooking.